80 F A ll 2018 Practice l ink.com A WellSpan Physician Career: What's your goal? Join WellSpan Medical Group, a physician-led organizaƟon providing innovaƟve care throughout southcentral Pennsylvania. We are part of WellSpan Health, one of the region's largest integrated health systems, with more than 1,200 providers, a network of six community and teaching hospitals, and comprehensive specialty care services. We're transforming the paƟent experience through health IT and care coordinaƟon across providers, care environments and life stages. At WellSpan, your goals are our goals. 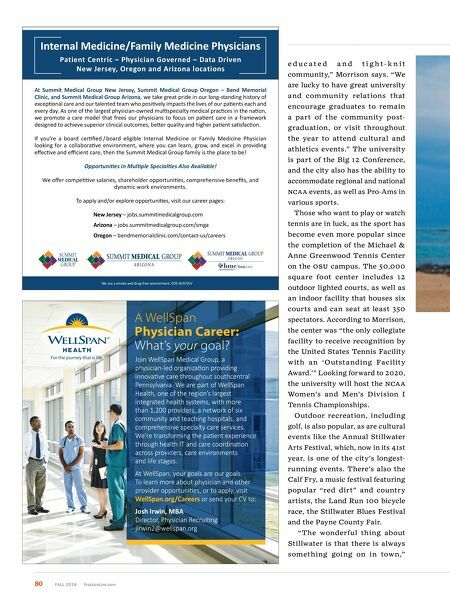 To learn more about physician and other provider opportuniƟes, or to apply, visit WellSpan.org/Careers or send your CV to: Josh Irwin, MBA Director, Physician RecruiƟng jirwin2@wellspan.org We are a smoke and drug-free environment. 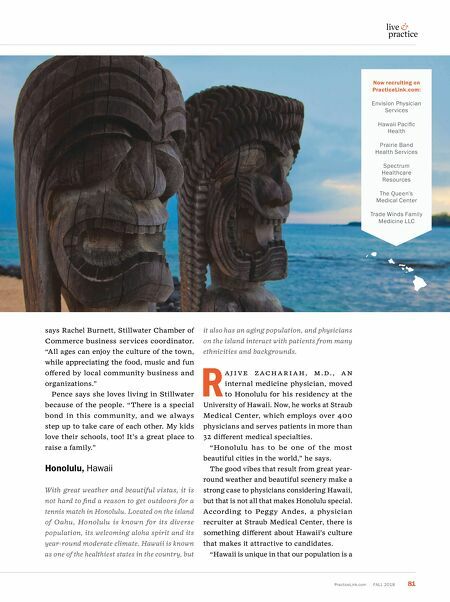 EOE M/F/D/V Internal Medicine/Family Medicine Physicians Patient Centric – Physician Governed – Data Driven New Jersey, Oregon and Arizona locations At Summit Medical Group New Jersey, Summit Medical Group Oregon – Bend Memorial Clinic, and Summit Medical Group Arizona , we take great pride in our long-standing history of excepƟonal care and our talented team who posiƟvely impacts the lives of our paƟents each and every day. As one of the largest physician-owned mulƟspecialty medical pracƟces in the naƟon, we promote a care model that frees our physicians to focus on paƟent care in a framework designed to achieve superior clinical outcomes, beƩer quality and higher paƟent saƟsfacƟon. If you're a board cerƟfied / board eligible Internal Medicine or Family Medicine Physician looking for a collaboraƟve environment, where you can learn, grow, and excel in providing effecƟve and efficient care, then the Summit Medical Group family is the place to be! OpportuniƟes in MulƟple SpecialƟes Also Available! We offer compeƟƟve salaries, shareholder opportuniƟes, comprehensive benefits, and dynamic work environments. To apply and/or explore opportuniƟes, visit our career pages: New Jersey – jobs.summitmedicalgroup.com Arizona – jobs.summitmedicalgroup.com/smga Oregon – bendmemorialclinic.com/contact-us/careers e d u c a t e d a n d t i g h t - k n i t community," Morrison says. "We are lucky to have great university and commu nity relations that encourage graduates to remain a part of the community post- graduation, or visit throughout the year to attend cultural and athletics events." The university is part of the Big 12 Conference, and the city also has the ability to accommodate regional and national NCA A events, as well as Pro-Ams in various sports. Those who want to play or watch tennis are in luck, as the sport has become even more popular since the completion of the Michael & Anne Greenwood Tennis Center on the o S u campus. The 50,000 square foot center includes 12 outdoor lighted courts, as well as an indoor facility that houses six courts and can seat at least 350 spectators. According to Morrison, the center was "the only collegiate facility to receive recognition by the United States Tennis Facility w ith an 'Outstanding Facility Award.'" Looking forward to 2020, the university will host the NCA A Women's and Men's Division I Tennis Championships. Outdoor recreation, including golf, is also popular, as are cultural events like the Annual Stillwater Arts Festival, which, now in its 41st year, is one of the city's longest- running events. There's also the Calf Fry, a music festival featuring popular "red dirt" and country artists, the Land Run 100 bicycle race, the Stillwater Blues Festival and the Payne County Fair. "The wonderful thing about Stillwater is that there is always something going on in town,"